Mitchell County Historical Society is excited to announce that Amanda Biddix is the recipient of its Third Annual Inez McRae Scholarship. Amanda, the daughter of David and Marsha Biddix of Spruce Pine, is a 2018 graduate of Mitchell High School. Her many academic achievements include a 4.75 GPA, three years of the President’s Award for Academic Excellence, and membership in the National Honor Society. She participated in numerous extracurricular activities, including Marching Band, Concert Band, and Show Choir. She plans to attend UNC Chapel Hill, studying history and archaeology. MCHS certainly applauds Amanda’s talent for history. The past three summers she participated in the Joara Archaeological Field School near Morganton, where a Spanish fort established in 1567 by Juan Pardo is being excavated. Amanda has competed in National History Day and the National History Bee, and she won first place in the Mitchell County Historical Society’s Annual History Bee, High School division, in 2018. The scholarship honors Inez McRae, founding member, anchor, and guiding force of Mitchell County Historical Society. Inez taught school for many years in Mitchell County, so it is quite fitting that our annual scholarship bears her name. Inez currently lives in Winston-Salem. 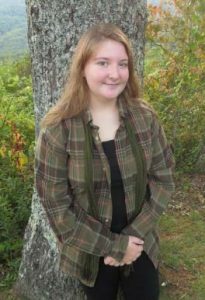 The MCHS scholarship is awarded to a high school senior from Mitchell County who demonstrates an interest in Appalachian studies, including, but not limited to history, music, art, folk culture, and economic or community development. The student selected demonstrates a desire to pursue this interest at a higher educational level and express a desire to eventually live and work within Appalachia. If you have problems with the application file, please e-mail mitchellnchistory@gmail.com with your issue. The Inez McRae Scholarship is awarded annually by the Mitchell County Historical Society to a Mitchell County high school senior in the amount of $1000. The applicant must be a high school senior who has demonstrated an interest in Appalachian studies, including, but not necessarily limited to Appalachian history, music, art, folk culture and economic or community development. The applicant must demonstrate a desire to pursue this study at a higher educational level and express a desire to eventually live and work within Appalachia. The scholarship is intended as a grant-in-aid to be used for educational expenses such as tuition, books and equipment related to the course of study. The application will require personal information regarding the applicant, including parents’ names and addresses, grade point average, information regarding any arrest history, future educational plans, and at least three references (two non-educational), and information regarding family income. An essay will be required in which the applicant will detail the area of Appalachian studies in which he or she has been involved, explain his or her educational intentions and discuss his or her plans for a future career. All applications will be referred to the Mitchell Historical Society Scholarship Committee who will review the applications, evaluate the applicants, and select three finalists. The applicant’s financial need may be a consideration in determining the finalists and/or the eventual winner. Upon receipt of the names of the finalists and their original applications, the Mitchell County Historical Society Board of Directors will conduct personal interviews with the applicants. Please contact us if you need more information or would like to share your thoughts about the scholarship application process.